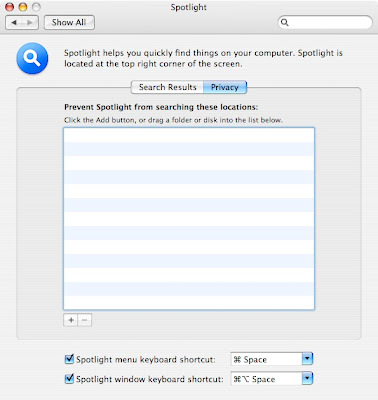 A New Mac Tip Every Day: Privacy with Spotlight! 1. Open System Preferences and choose "Spotlight". 3. Click on the small "+" and choose the folders that you don't want Spotlight to search through. But this won't secure private folders when we use a simple Desktop Cmd-F search, (which I find more convenient and quicker than using Spotlight) will it? Couldn't someone just look into those privacy settings to see what folders you wanted to hide? It sounds like it is intended no so much for security but just, as the saying goes, "to keep an honest man honest." In other words, not to protect your stuff from deliberately prying eyes, but to prevent sensitive material from popping up during an innocent search by another user.